With my morning coffee half way gone and a quick review of Wired News, something disturbing occurs to me as I read the latest report IHS Global Insight on EV technology and plug-in hybrids. Sure, it is easy to imagine that 20% of our market can comprise plug-in hybrids and battery electric vehicles. DUH! But we continue to talk about plug-in hybrids as the next best thing for the U.S.! Come on...we already have 100% EV options! Why do we continue to talk about plug-in hybrids? We need to simply get off the dependency of foreign and domestic oil that we continue to rely on for daily transportation (not just cars; of course, there are buses, motorcycles, and trucks). President Obama has already set aside $2.4 billion as a catalyst for research and development, and if that is not enough motivation, then look at the proof of what other manufacturers have already accomplished. Nissan LEAF, Mini E, RAV4 EV, FT-EV II, GM Volt, Tesla Motors, and I have not even begun to mention some of the electric motorcycles. The media should stop telling us that plug-in hybrids are the next best thing since sliced bread. We have the technology, brains, money and creativity to go beyond that and develop beautiful, functional, long-lasting electric vehicles for all types of families (yes, soccer moms and Mr. CEO...those cars are already available to you). As we work on the challenges of battery life, charging infrastructure, and general renewable energy, folks just can't wait for the opportunity to drive on electricity. I was fortunate enough to drive a MINI-E for a whole weekend in Los Angeles during the Opportunity Green Conference this past November. Smooth, quiet, regenerative brakes is something that just didn't fit in my stocking that Christmas. However, I am continuously pleased to see the amount of excitement on both coasts to tap into zero emission vehicles. 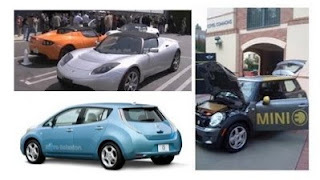 I encourage each of you to get out of your bubble, learn one or two cool new facts about EV technology and report back to me on this blog. I want to hear about your EV adventures and see how the U.S. can turn things around with an electric buzz. I understand your desire for a pure battery EV (BEV), but there are legitimate reasons for a plug-in hybrid (PHEV). While most Americans drive well under 40 miles a day, there are some who need to drive long distances on a regular basis, so for them, having a PHEV makes sense. They'll get to drive on electricity for most of their daily driving, but will have the ability to hop in the car and go anywhere at a moment's notice with the PHEV. Also, PHEVs allow for smaller batteries to be used in the car since the all-electric range is much less than in a BEV. This should enable more people to buy these cars and also allow for more plug-in vehicles to be built since the same number of battery cells can be used for 2-3 PHEVs as in one BEV. I drive a BEV and really don't want to drive anything that burns gas, but when I need to go long distance, I take our gas guzzling Honda Insight. While 60 mpg is decent, I know that my next car will be a PHEV since it'll allow for over 100 mpg. 60% of American homes have two or more cars. One PHEV will serve the home for all long distance driving and the rest of the cars can be 100 mile range BEVs. The media are still quite ignorant about the difference between the two, so I often see them equating BEVs and PHEVs. Thanks for the insight on the BEV vs. PHEVs! All good points. Still waiting for the market and media to become more knowledgeable about this technology in order for more early adopters (on the East coast and Midwest) to drive them. Should be an exciting 2010!